Although Brett Lawrie is currently a free agent, he’s been training hard and involved in some pretty cool off the field events. He teamed up with Pringles for fans to slide 50 feet through ketchup. 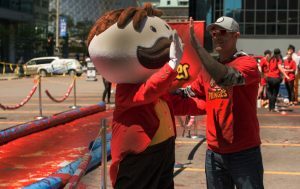 The Pringles Ketchup Slippery Slide came to Downtown Toronto to help launch new Pringles Ketchup flavour. Ketchup chip keener and former Toronto Blue Jays player Brett Lawrie hosted the event, which aims to set a world record for the most Canadians to slip down a Ketchup Slippery Slide in one hour. The 50-foot slide was set up at Front and Simcoe streets, west of Union Station, from 11 a.m. to 2 p.m. Saturday, June 3. Each person who suited up to slip down the slide got a chance to win $1,000. Visit Pringles Canada’s Facebook page for more information, and follow the action on social media using #KetchupSlipperySlide.